The amusingly titled ‘Titi Parisiennes’ is not as one may imagine a continental branch of Ann Summers, but in fact the best Canne de Combat competition in the World. Held annually by the famous Apache de Paname Club of the 13th Arrondisment in Paris, it is a team event with 3-4 fighters per team. Fights consist of 8 times 1 minute rounds, held in a 9 metre circular arena, with continuous, full contact fighting. At the end of each round a fight may ‘tag’ out or stay in for one more round. The fights are refereed by a single Arbitre, and scored by three judges. This year’s completion was the largest ever, with 81 competitors in 25 teams, and 4 arenas running simultaneously. It is a peculiarity of the Competion that teams fight under a nick-name. There were teams from Great Britain, France, Gemany, Czech Rebublic, Martinique and Slovenia. The Great Britain team, ‘The Minions’, consisted of myself (Jon West), Morgan Alexander and Stuart McIntyre along with our band of supporters/groupies Agnes Aubert, Newman Burdett and Dal Belkhiri. To give you a flavour of the kindness and generosity which typifies the sport of Canne de Combat, Stuart and Agnes had accommodation in Paris, but myself, Morgan and Newman were kindly given the use of a flat in Pigalle by Mark Pearce a French fighter who we had never even met. The Competion was planned to last two days; however the local caretakers Union put pay to the Sundays fighting as they closed the sports hall as a result of industrial action. This meant that as many fights as possible were held on the Saturday, and by some magnificent organisation by the Apaches de Paname a total of 125 fights were held between 10am and 7pm! In between fights, teams were often called on to act as Judges, which made the whole event possible and were a good reminder to each of us which attacks scored points and why. As Captain I was delighted with the team performance, especially as we had fought several of the harder teams. 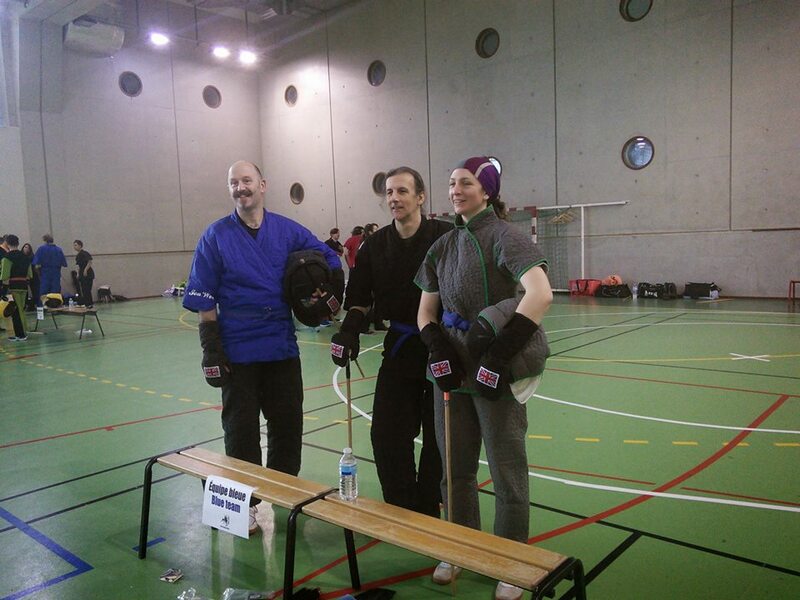 These included Team Flanc Captained by the men’s world champion, Benjamin Latt, against who we acquitted ourselves well winning at least a couple of the rounds although losing the fight. My favourite fight was against the team from Figeac, Captained by Kevin Colin. Kevin was the first person I fought in an international Competion back in 2002, and I had not seen him since. The whole fight was typified by a joie de vivre, with both sides putting on a as acrobatic a display as possible, and was rewarded with a round of applause at its conclusion. Our team had a total of ten fights, and at the end of the day we were placed 13th, it was unfortunate that the competition was cut short as I believe we would have ended in an even better position, but really the achievement was in taking part in a brilliant days fighting amongst friends from around the World. Particular thanks should be given to our merry band of supporters, especially Agnes Aubert who acted as translator for the organisers.